The standout wine of a terrific and interesting dinner at La Malaje this week with Carmen Fandino of Williams & Humbert was this new saca of an old favourite. Part of the outstanding Williams Colección Añadas, it has been a lot of fun to follow the progress of this wine in particular. 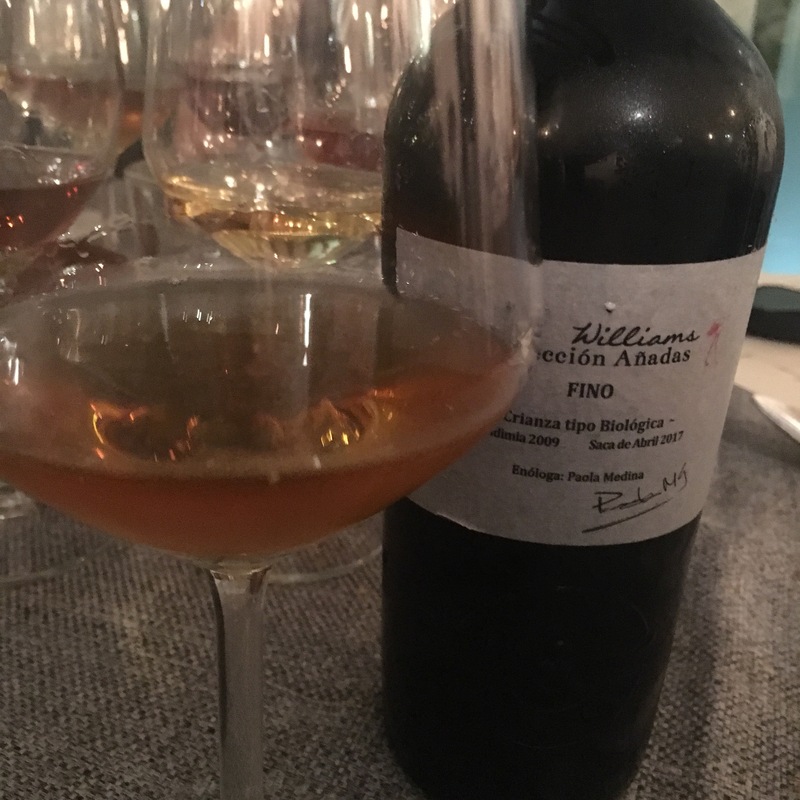 You would say the first saca, in February 2016, was already on the cusp of amontillado and certainly a lot more hazelnut richness than your average fino, while the February 2017 saca was a step closer to the precipice (and maybe even nicer). This one seems to have just stepped over the other side, and Paola Medina apparently agrees: we were told this would be the last bottling of this wine as a fino. But, as someone once said, what’s in a name? I certainly hope it isn’t the last we will see of the wine itself because it really has a lovely hazelnut sweetness to it – on the nose in particular – which makes it extremely approachable. In general I find that añada wines sometimes have less turbopower than their solera brethren, and this one is certainly a shade less punchy and mineral than a solera fino with eight years under flor would be. But it has a nice balance with that hazelnut and none of the bitterness you can get with the more powerful finos. One of the great joys of añada wines is this kind of variety. Wines of different añadas start with different characteristics, and then develop differently. As a result they are always worth trying (and buying). Like Forrest Gump’s chocolates you never know what you are going to get.